No training due to chest infection! Christmas came slightly early on December 23rd as £1,150 was added to the charity fund total in a little over 60 minutes. I was just in the middle of starting/finishing my Christmas shopping in the Metrocentre when the emails from justgiving.com came through on my phone. First up was a £50 order for Run Geordie Run t-shirts from Paul Robinson. He ordered one for himself and a couple for his niece and nephew in the USA (New Jersey). They are going to spread the word of the run stateside while wearing the t-shirts! Brilliant! Next up was a £100 pledge from Geoff Atkinson with the message "Good luck with your monster run! I may have to come out and see it with my own eyes when you are passing through Pennsylvania". At the time, these 2 donations put the charity fund up to £4,660. I was very pleased with that total. Especially given that this time last year I wrote "The fundraising target is a very ambitious £50,000. At the time of writing there is £1395 worth of pledges on the board. That's not bad at all given that the run is still over 2 years away! I'd like to think that by the end of 2009 that figure will have nudged close to £5000.". Well at £4,660 you can safely say that the figure did indeed nudge close to £5,000." But we don't want to give you that!" as Mr Tarrant would say!!!! Fast forward an hour in the Metrocentre and you'd find me knee deep in lingerie. For the missus of course! I got another couple of emails on my phone and I couldn't quite take the words in quick enough. I couldn't quite believe what I was reading! The 2 emails were from The Northern Rock Foundation notifying me that my application for the matching of some of this year's donations had been successful! In fact the application had been very successful and they had sent both St Benedict's Hospice and The Children's Foundation a cheque for £500 each. "WAHOOOOO!!!" I exclaimed waving my iPhone in one hand and a matching Miranda blue bra and thong set in the other!!! (as you do!). You should have seen the dirty looks I got from the nearby shoppers! Although the moment flashed by in an instant, I can recall countless stunned faces with accusing, squinted eyes fixed right in my direction. 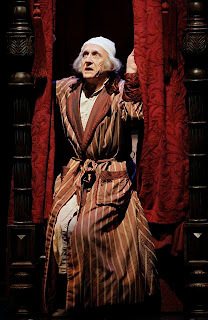 Thinking back, my celebrations were not unlike the moment Ebenezer Scrooge woke up on Christmas morning with the realisation that he is still alive: "I don't know what to do!'' cried Scrooge, laughing and crying in the same breath. ``I am as light as a feather, I am as happy as an angel, I am as merry as a school-boy. I am as giddy as a drunken man. A merry Christmas to every-body! A happy New Year to all the world! Hallo here! Whoop! Hallo!''. Needless to say, I left the shop rather hastily and, thanks to the Northern Rock Foundation, Mrs Allison won't be getting any undies for Christmas this year! The fact that the 2 charities will be receiving £1000 more than makes up for it though! But seriously! On behalf of St Benedict's Hospice and The Children's Foundation I'd like to sincerely thank, not only the Northern Rock Foundation, but also every single individual who has contributed so far to the charity fund. It currently stands at £5,660. I'd like to think that, by next Christmas, the fund will have nudged close to £15,000. It's an ambitious target but this is a big, nay massive, run and it needs a massive fundraising target! Finally, while we're in the Christmas mood, I'll leave you with another line from Dickens' A Christmas Carol - "And so, as Tiny Tim observed, God Bless Us, Every One!". Tis the season of goodwill and I'd like to take the opportunity of saying a sincere thank you to the following generous supporters of Run Geordie Run. Random act of kindness in the snow leads to a fund milestone! 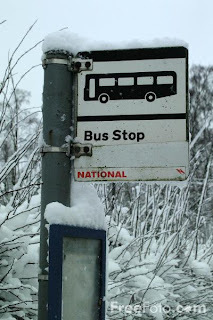 I got snowed in yesterday, so it was a case of having to get the bus to the Newcastle v smoggies match. Now I reckon the last time I got the bus to any match was when Ossie Ardiles was the manager! That's nearly 20 years ago! Those were the days! Me and the lads would sometimes treat ourselves to a seat in "The Benches" for £6 in the East Stand when we were flush! Anyway, I digress! There I was standing at the bus stop, ankle deep in snow waiting for the number 45 bus. There was a good 2 hours before kick off, but with a distinct lack of a sighting of any bus I was not too confident of getting there on time. Missing the kick off, by the way, is my ultimate nightmare! It's only happened once in 24 years of going to the match and I don't intend to ever let it happen again. I hadn't been standing there for very long when another chap joined me at the bus stop. He too, as it turned out, was off to the match. We got talking and it turned out that he was a runner with an impressive running CV as I later found out. We got onto the subject of my run across the USA and he said "Ah, so you're him!". I was taken aback at first but it turned out that this chap had just been reading about the run via nufc.com the previous day. What a small world! I always find talking to new people about the run across the USA a very enjoyable experience and this occasion was no exception. After about 40 minutes the bus eventually turned up! What a relief! The chap kindly insisted on paying my fare into town saying "Put it into the charity fund". So when I got home after the match I went straight onto www.justgiving.com/rungeordierun1 paying £4 to St Benedict's Hospice. Out of interest I did a quick calculation to see what the latest total figure was. To my sheer delight, I found that it was a nice round £4,500.00. Brilliant! Thanks to Don Kent (of Blackhill Bounders Running Club) for paying my bus fare and getting the charity fund up to another milestone. And thanks to the team for getting 3 points against a very poor smoggies side. A good day all round! Thank you to Complete Football! I got a smashing email last week from the kind folk up at Complete Football at Newcastle Race Course. It was an offer of complimentary gym membership lasting up until the run across the USA in 2011. Of course, I accepted the very kind offer without hesitation. Having another option within my training schedule will be very useful indeed. It's a well stocked gym with plenty of machines spread across a very generous floor space. In fact, it's one of the largest gyms I've ever been in. I've got a feeling I'll be getting to know those treadmills very well during the winter months! Although I've yet to use the facility in anger, my first impressions of it were very good. The thing that stood out straight away was just how polite and helpful the staff I spoke to were. That's a very good sign as far as I'm concerned. I'll post an update on the gym when I return to training in the next few weeks. I reckon I'm about 10 days away from getting fully rid of this chest infection! In the meantime, if you're looking for a spacious, well stocked gym with friendly staff in the Gosforth area then I reckon you should give the gym at Complete Football a try. With membership prices starting from as little as £18 per month there is great value to be had here. For more information why not visit www.completefootball.net. Tell 'em I sent you and I hope to see you running on a treadmillbeside me in 2010! Whereeeeerrrreeereee has the t-shirt been this week? Yet another week goes by and another set famous faces get pictured with the now infamous Run Geordie Run t-shirt. We started off with Melinda Messenger and Kate Walsh from Live from Studio 5 a few weeks ago. Then it was the turn of the Newcastle Falcons squad. Following that, was ex-Newcastle United midfield general Paul Bracewell. "Where does the Run Geordie Run PR machine go from here?" I hear you ask. Well today's destination was the Sky studios in Isleworth, West London! First up, before the shooting of Sky's Saturday morning show Soccer AM was the very lovely Helen Chamberlain and Max Rushden. I've watched the show for almost 15 years now and the picture to the left just hasn't sunk in yet. That's a Run Geordie Run charity T-Shirt on the set of Soccer AM! Very surreal! When Helen and Max were told a few details about the 3100 mile run across the USA in 2011 they were gobsmacked! "He's doing what??!! Really??!!". As an added bonus, I've been invited to join the actual live audience on the Soccer AM show in the New Year! Training schedule permitting, I'll try my very best to attend. Newcastle still have 2 games to play in London so I could kill a few birds with one stone! Well, you'd think it couldn't get any better than that! But you'd be wrong! 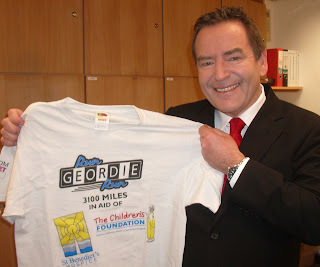 Next to lend his support to the Run Geordie Run cause was none other than the legendary Jeff Stelling!! This shot was taken just before Jeff took his place at the head of the Soccer Saturday panel. Again, like Soccer AM, this is a show I've watched since the mid nineties and again the picture to the right seems a very surreal one! To see Jeff pictured with a Run Geordie Run t-shirt is an amazing sight for me personally. Jeff, is of course, a Hartlepool lad and is most respected, in my opinion, for his very unique style of enthusiastic punditry. When I were a lad, growing up in the 70's/80's, it was Dickie Davies who I always remember on a Saturday teatime delivering the results. Thereafter, and what seems like a lot longer, it's always been Jeff and the team. That's just to put this into context and to try and explain just how thrilling this all is for me personally. More importantly though, is that fact that the word is spreading! 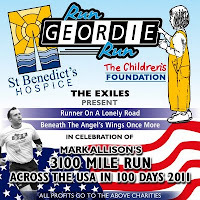 The word is spreading thick and fast about one man's quest to become the first Geordie's to run 3100 miles across the USA in 2011, raising as much cash as possible for St Benedict's Hospice (Charity No 1019410) and The Children's Foundation (Charity No. 1000013). Don't forget to tune in next week to find out where the t-shirt has been! Oh and at the time of writing I can report that sales of Run Geordie Run t-shirts have contributed just over £2,000 to the current total of £4496. 1) Pay £10 per t-shirt required to www.justgiving.com/rungeordierun1 (St Benedict's Hospice) or www.justgiving.com/rungeordierun2 (The Children's Foundation). Or you could choose to split your payment and pay £5 to each charity. The choice is yours. Cheques payable to either charity are also accepted. Please get in touch at rungeordierun@googlemail.com for details on where to post your cheque. 2) Email rungeordierun@googlemail.com with details of how many t-shirts you would like, size(s) and where they should be posted to. Finally, I'd like to say a huge thank you to Susi Moser for arranging the support and taking the photos. Sunday 13th December - 10.5 mile run, The 6 Bridges Challenge. (01:48:22). I was very honoured recently to be asked to give an interview to the most excellent Run Run Live Podcast. The show is based in the USA and is hosted by Chris Russell. For those of you who haven't heard the interview yet, you can hear or download the interview in episode 93 of the Run Run Live Podcast by clicking here and then selecting the pod button. I'm on about 10 minutes into the show. If you have a few spare minutes it's well worth a listen. As I reported yesterday; "It was obvious at the end of the run that I had returned to training too early and the plan now is to rest up until the cough has gone. Fingers crossed that I'm only a week or two away from running again.". I took the drastic step (for me) of visiting my own Doctor this afternoon. After sounding my lungs out, right enough, she agreed that the chest infection is still there! Gutted! She prescribed me some antibiotics and steroids to take over the next week and advised no exercise for 2 weeks. Gutted! I'm taking consolation in the fact that this will give me a chance to enjoy more of Christmas with my family. It will also give me a chance to concentrate on the many, many tasks involved with the planning and preparation for the USA 2011 run. Believe you me, my USA road atlas is very well thumbed indeed! I may need another one very shortly at this rate! I'll also be spending time researching how I can best avoid another chest infection. I think another 37 mile run in cold, wet conditions is never to be repeated! I've got nothing to prove now. I know I can go the distance in a single session. It pains me to say it but I think I need to make better use of the treadmill on the colder days where longer distances and considerably more time is needed! I'm also looking into arranging another winter training week abroad in as difficult a climate I can find. After all, these are the conditions I'll be running in during the Summer of 2011. Finally, I'm in constant contact with trainers and mentors David Fairlamb and Mark Fleming. I'll be continuing to ask them for their advice and re-assurance every step of the way. These 2 guys have played a massive part so far in my preparations for the run across the USA in 17 months time! 17 MONTHS TIME!!!!!!!!! Well then! The Run Geordie Run t-shirt continues to lead one heck of a journey. Last week it was in the company of The Newcastle Falcons squad. The week before that Melinda Messenger and Kate Walsh got their hands on one. This week it was the turn of one of my heroes from the nineties. I remember his debut for Newcastle and the goal he scored in that game as if it were yesterday! 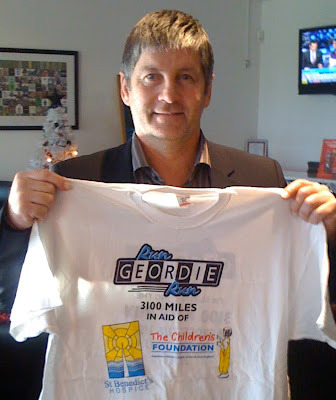 So you can imagine my excitement when ex Newcastle United midfielder Paul Bracewell declared his support for the Run Geordie Run cause this week. I was lucky enough to meet him while on a tour of the superb COMPLETE FOOTBALL complex near Newcastle Race Course. "Brace" seemed to be very impressed when I told him about the run and after a good half an hour chat he was more than happy to sign a Run Geordie Run t-shirt. Perhaps another one to auction off in the future? I must admit that I found Paul to be a very nice guy indeed. As for the COMPLETE FOOTBALL complex that he is involved with, all I can say is that the facilities are absolutely first class. My son, Jack, started goalkeeping coaching there this week and he loves it. He's also signed up for the Christmas Football Camp they are running in association with the Newcastle United Foundation. I think he's almost more excited about that than Christmas Day (Almost!). Don't forget to tune in next week to find out where the Run Geordie Run t-shirt gets to. My plan to sweat out this chest infection has failed miserably! On Friday I spent an hour on my Spinning bike. I felt really good after this session so it was off to David Fairlamb's Beach Bootcamp on Saturday morning. That was a really tough session with little room to get your breath back. Very, very enjoyable as ever though! Straight after Bootcamp I managed 4 lots of steps in King Edward's Bay. It was a very poor effort but I saw it as a start all the same! I went into Sunday's 10.5 mile "Peter's Pies 6 Tyne Bridges Challenge" with the aim of just getting round in 1 piece. The first 6 miles were slow but at least I didn't experience the coughing fits that have plagued me for 4 weeks now. I had to stop quite a few times during the final 5.5 miles to cough and spit. Nice! It was obvious at the end of the run that I had returned to training too early and the plan now is to rest up until the cough has gone. Fingers crossed that I'm only a week or two away from running again. In the meantime, all of a sudden, I have lots of time on my hands with which to continue the planning, preparation and fundraising for the USA 2011 run. Every cloud!!! Saturday 12th December - David Fairlamb's Beach Bootcamp. (00:45:00). Saturday 12th December - 3 x steps in King Edward's Bay. Time to sweat it out! I haven't done any running for 8 days now due to this nasty chest infection. I trained through the first 2 weeks of it but enough was enough last week and I ended up taking a very rare trip to the doctors and getting prescribed some antibiotics. It's the third time I've had a chest infection in 12 months incidentally! I hardly ever pick up a conventional injury so it seems like my immune system is the thing that is most likely to let me down. I've been getting only marginally better each day while taking the antibiotics and tomorrow sees my return to light training. If I wait until I feel 100% again then it could be weeks more before I start training. I'll be hitting the gym for an hour or so in an attempt to try and sweat this thing out. Saturday will see my return to David Fairlamb's Beach Bootcamp. Regular readers will know how much I enjoy this 45 minute session on Tynemouth Beach. I would recommend it to anyone who wants to get the weekend off to a great start with an overall body workout. You don't have to be a total athlete either! David Fairlamb has the knack of letting you train at your own pace. The session starts on the beach opposite the Grand Hotel in Tynemouth at 9 am. I would recommend getting there 10 minutes early in order to register etc. Click on the following link for a video of a typical session. After Beach Bootcamp, I will be attempting a few runs up the steps in nearby King Edwards Bay (pictured above). The aim this week is 5 lots of steps. I think my poor suffering lungs should just about be able to handle that. Week 59 of USA 2011 training starts on Sunday and I'll be doing a gentle 10.5 miles on the 6 Bridges Challenge route. Or should I say the "Peter's Pies 6 Tyne Bridges Challenge". Yes folks, the regular Sunday morning run that has been going for just 5 weeks now has an official sponsor and it's the 2 charities who will be benefitting. I'll talk more about this run and it's importance and relevance in the build up to USA 2011 at a later date. If you fancy joining the merry band of runners who attend then we meet at the Newcastle end of the Millennium Bridge at 9 am each Sunday. Click here for a review of our first outing last month. In the meantime, I hope to see as many of you as possible on Sunday morning on the Quayside. So then, it's an important 3 days! It's a 3 days where I'll be easing gently back into the old routine. I'm probably 2 weeks away from getting the full schedule up and running again. After that, the aim is to build up to 31 miles per day on consecutive days. If all goes to plan I should reach this target by the end of March 2010. I'm not thinking too much past the next 3 days, though, for now. The Run Geordie Run t-shirt grand tour continued this week in great sporting style when captain Carl Hayman brought his Newcastle Falcons squad to Northern Rock for a signing session. I took the opportunity to get some Run Geordie Run t-shirts signed by the full squad. Which was nice! Perhaps I'll auction these off in aid of the 2 charities in the near future. Any offers folks? Before the squad signed the shirts, the Falcons PR girl asked me to stand up, introduce myself and tell them all what the run across the USA was all about and who I was raising funds for. It's a good job that talking about and promoting the run is very much my forte these days. The lads looked very impressed indeed when they heard about how many miles I had to run and how many days I had to do it in! As I made my way round the squad with t-shirts to sign I was bombarded with questions from all angles. "How many miles do you have to run each day", "What time of year will you be running? ", "Do you hope to get out of Vegas?" were just a few examples. I've got to say that I very much enjoyed answering each and every question that was thrown my way. The lads were really friendly and the fact that they showed a genuine interest in the USA 2011 run has served as a massive morale boost! Thanks go to Louise Rourke and Louise Ormston for arranging the signing session and to Carl Hayman and the Newcastle Falcons for making my day, month and year! Don't forget to tune in to the same place next week to find out where the Run Geordie Run t-shirt gets to! It gives me great pleasure to report that the fund for St Benedict's Hospice (Charity No. 1019410) and The Children's Foundation (Charity No. 1000013) has burst through the £4,000 barrier and currently stands at £4,031.50. For the benefit of readers in the USA, at the current exchange rate, that's converts to $6,539.03. I think this is an amazing amount of money, given the current financial climate, rising levels of unemployment and the fact that there are so many people doing so many amazing things these days to raise funds for charity. Without doubt, the recent publicity on www.nufc.com has been instrumental in seeing the fund leep from £3,000 to over £4,000 in just 3 weeks!!!! As a result, Run Geordie Run t-shirt sales have increased massively. I'm very proud to say that I've posted t-shirts all over the North East region as well as various places and the UK and even some to Australia, New Zealand and the United Arab Emirates!! My thanks go to Biffa at www.nufc.com who has backed me to the hilt on numerous fundraising events in the past and he continues to do so. He has a vast audience of Geordies worldwide. To allow me to spread the word of the next big run to all of those good folk will be the one factor that makes a massive difference to the charity fund and the event in general. Thanks also go to Peter's Pies who have been matching everyone's contributions at a ratio of 50p in the £1. This has made a massive difference to the total and, as per the sponsorship agreement, the deal will soon be coming to an end. Rest assured, though, I'll continue to push as hard as I can to unlock as much money as I can from that agreement. I'm on the look out for similar deals in 2010 from various companies. 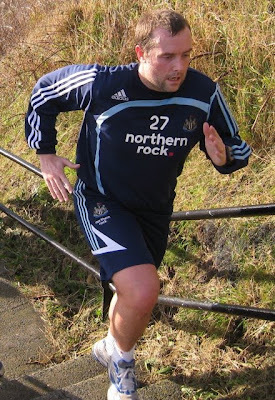 So if you would like to sponsor Run Geordie Run in a way similar to Peter's Pies then please get in touch. Aside from contributions to the charity fund, I've had some very interesting emails from various people offering help and support in the USA. I'll be pursuing each one of these and hopefully I can make best use of these very kind offers. Finally, I'd like to thank everyone who has contributed to the charity fund so far. Your support really is appreciated not only by me but also by the staff at St Benedict's Hospice and The Children's Foundation. If the charity fund stands at £4,031.50 now, I shudder to think what the final amount will be when I reach New York in August 2011. ....one of these very stylish and exclusive Run Geordie Run t-shirts (as modelled by Kate Walsh and Melinda Messenger)? If the answer is yes, then please follow these 2 simple steps. 1) Firstly, choose which of the 2 charities you'd like to pay your £10 (per t-shirt) to. This can be done at www.justgiving.com/rungeordierun1 for St Benedict's Hospice or www.justgiving.com/rungeordierun2 for The Children's Foundation. Or you could choose to split your payment and pay £5 (per t-shirt) to each charity. The choice is yours. Cheques are also accepted and should, again, be made payable to 'St Benedict's Hospice' or 'The Children's Foundation'. The choice is yours. Please get in touch at rungeordierun@googlemail.com for details on where to post your cheque. 2) Once your payment has been made please email me at rungeordierun@googlemail.com with details of how many t-shirts you would like, size(s) and where they should be posted to. T-shirts are available in small, medium, large, extra large and extra extra large. So, in summary, it's as simple as making your payment using the justgiving links specified above and then get in touch with details on quantity, size(s) and your address. Finally, I'd just like to say many thanks on behalf of St Benedict's Hospice (Charity No. 1019410) and The Children's Foundation (Charity No. 1000013) in anticipation of your support. Having personally seen the services that these 2 outstanding North East charities provide, you should be confident with the knowledge that your contribution will be put to very good use indeed. Wheeeerrrreeeeee has the t-shirt been this week? Oh boy, oh boy! The Run Geordie Run t-shirt is certainly getting about these days. Today, I was very grateful to Kate Walsh and Melinda Messenger for taking time out between makeup and appearing on screen on "Live from Studio Five". This snap was taken by their makeup artist Susi Moser who told the girls all about the up and coming run across the USA in 2011. Susi said that "They were both gobsmacked when they found out about the run". To say that I was "over the moon" is an absolute understatement when Susi passed on the girls good wishes and told me that they wished me "lots of luck". Thanks to Suzi for putting the Run Geordie Run t-shirt she bought recently to very good use indeed. You can catch Kate and Melinda (and Ian Wright) on Channel 5 weekdays from 18:25 until 19:30. I've tried my best to train with this chest infection, however, last night things came to a head. I was just setting off on my 3rd session of the day, a short 3 mile run back home, when I all of a sudden had a shortness of breath. I'd hardly gone a 1/4 mile when I felt as if the flow of air through my lungs was severely restricted. It was so bad that I walked the rest of the way home! It's not like me to go to the doctors but after a couple of people suggested that I should go I made the trip to the Walk In Centre in Newcastle. What a brilliant service! I was in and out within 30 minutes and came away with a prescription for antibiotics and a recommendation to rest for 7 days. I'll be taking this advice and I'm gutted that I'll be missing out on a few runs but especially gutted to be missing 2 training sessions with Mark Fleming, David Fairlamb's Beach Bootcamp and, of course, the now traditional Sunday morning run across the 6 Tyne Bridges. As soon as this chest infection is over, though, I'll be starting the next major cycle in my training. As I mentioned in an earlier blog post, the next stage of training is all about building up big mileage and doing it day after day. By the end of March I hope to be able to comfortably run 31 miles one day and then do it all again the next. The target after this, is to run 31 miles per day for 7 days. I hope to achieve this by the end of August 2010. Given, all of the running I've done so far, and the support and encouragement I'm getting from so many people, I'm pretty confident of reaching the next major target in August 2010. The margin for error next year, though, is so very small. I've got away with making a lot of bad decisions this year. Next year is a completely different ball game. The scope for missing runs is virtually non existent. I've got to sort my nutrition out once and for all. Finally, choosing the right time to rest is very important too. There are challenging times ahead for sure. For the next 7 days, however, it's all about resting and taking antibiotics! Sunday 29th November - 10.5 mile run, The 6 Bridges Challenge. (01:37:13). PB! Tuesday 1st December - 2.9 mile run, Jesmond to Gosforth. (00:29:57). Tuesday 1st December - 5 mile run, Race Course. (00:49:27). Tuesday 1st December - 2 mile run, Gosforth to Jesmond. (00:28:50). Ways to support Run Geordie Run's 2 chosen charities. There are a number of ways to support the 2 charities that Run Geordie Run is raising funds for (St Benedict's Hospice and The Children's Foundation). In response to a few emails that I've received today here they are. Oh and I should mention that thanks to my pals at Peter's Pies, for every £1 paid, they will add 50p! This unbelievably generous offer expires at midnight on 31/12/2009. Geordie Band, THE EXILES, have written and recorded 2 songs to support the 3100 mile run across the USA. They are entitled "Runner on a lonely road" and "Beneath the angel's wings once more". The artist's time and expenses were kindly given free of charge allowing the full £3 per CD to go to the 2 charities. 1) Pay a minimum donation of £3 per CD required to www.justgiving.com/rungeordierun1 (St Benedict's Hospice) or www.justgiving.com/rungeordierun2 (The Children's Foundation). Or you could choose to split your payment and donate to each charity. The choice is yours. Cheques payable to either charity are also accepted. Please get in touch at rungeordierun@googlemail.com for details on where to post your cheque. 2) Email rungeordierun@googlemail.com with details of how many CDs you would like and where they should be posted to. Running 3100 miles across the USA is a massive undertaking. Just like the 2007 run from John O'Groats to Lands End, I'll be running in memory of lost family members such as my parents Margery and Terry and my brother David. I don't want the dedication to lost loved ones to stop there, however. I want to open up this event to as many people as I can. Apart from the obvious effects of raising 10's of thousands of pounds for the 2 charities, it is my sincere hope that this run will have as far reaching an effect as possible and will serve to inspire and to give hope and comfort to as many people as possible. I know from the 1000's of emails I've received over the last few years, just how much the run in 2007 and the cause I was running for meant to all of those people who got in touch. It soon became apparent that for every 1 runner like me, there are thousands of stories of great loss but usually great inspiration also. It is my hope that 3000 miles of the run from California to New York in 2011 will be dedicated to the memory of a lost loved one. I will create a register on this site of all of the names and provide space for a comment or dedication to be left if the recipient wishes. These people will be in my thoughts as I run each mile and I will most certainly hope to draw on the dedications left for inspiration as well as running in their memory. There will be a nominal cost of £2 for each mile. It will be the recipients choice whether this will go to St Benedict's Hospice or The Children's Foundation. 1) Pay £2 per mile that you wish to dedicate in memory of a lost loved one to www.justgiving.com/rungeordierun1 (St Benedict's Hospice) or www.justgiving.com/rungeordierun2 (The Children's Foundation). Or you could choose to split your payment and donate to each charity. The choice is yours. Cheques payable to either charity are also accepted. Please get in touch at rungeordierun@googlemail.com for details on where to post your cheque. a) Your name or family name. b) The name of the person I'll be running in memory of. c) A dedication and/or some information about the person I'll be running in memory of (Optional). d) A picture of the person I'll be running in memory of. (Optional). e) Whether you'd be happy for me to include some or all of the above details in a register on this website and if you'd be happy to have the person's name mentioned on this site during the run. You can supply as much or as little information as you would like. Hopefully, all miles will be dedicated but one thing is for sure, it will be an honour and a privilege to run in the memory of all of those people who are sadly no longer with us. 1) Make your pledge to www.justgiving.com/rungeordierun1 (St Benedict's Hospice) orwww.justgiving.com/rungeordierun2 (The Children's Foundation). Or you could choose to split your payment and donate to each charity. The choice is yours. Cheques payable to either charity are also accepted. Please get in touch at rungeordierun@googlemail.com for details on where to post your cheque. Running 3100 miles across the USA is a massive undertaking. Just like the 2007 run from John O'Groats to Lands End, I'll be running in memory of lost family members such as my parents Margery and Terry and my brother David. I don't want the dedication to lost loved ones to stop there, however. I want to open up this event to as many people as I can. Apart from the obvious effects of raising 10's of thousands of pounds for the 2 charities, it is my sincere hope that this run will have as far reaching an effect as possible and will serve to inspire and to give hope and comfort to as many people as possible. I know from the 1000's of emails I've received over the last few years, just how much the run in 2007 and the cause I was running for meant to all of those people who got in touch. It soon became apparent that for every 1 runner like me, there are thousands of stories of great loss but usually great inspiration also. It is my hope that 3000 miles of the run from California to New York in 2011 will be dedicated to the memory of a lost loved one. Nearer the time of the run, I will create a register on this site of all of the names and provide space for a comment or dedication to be left if the recipient wishes. These people will be in my thoughts as I run each mile and I will most certainly hope to draw on the dedications left for inspiration as well as running in their memory. There will be a nominal cost of £2 for each mile. It will be the recipients choice whether this will go to St Benedict's Hospice or The Children's Foundation. 1) Pay £2 by visiting either justgiving.com/rungeordierun1 for St Benedict's Hospice or justgiving.com/rungeordierun2 for The Children's Foundation. The choice is yours as to which charity to donate to. c) A dedication and/or some information about the person I'll be running in memory of. d) A picture of the person I'll be running in memory of. Hopefully, all miles will be dedicated, but one thing is for sure, it will be an honour and a privilege to run in the memory of all of those people who are sadly no longer with us. Run Geordie Run sinks to new depths! Have a look at this superb photo! I was gob smacked when I first saw it. It was sent to me by work colleague Richard Scholfield who was also a very generous sponsor of my run from John O'Groats to Lands End in 2007. Richard was one of the first people to buy a Run Geordie Run t-shirt and he's obviously put it to very good use in an attempt to help spread the word of the next big run across the USA in 2011. The photo was taken at a depth of 30 metres on the floor of "The Canyon"; a famous dive site near Dahab, on the Sinai Peninsula in Egypt. I'm reliably informed that 30 metres is generally accepted as the maximum depth achievable using recreational scuba equipment! Richard went on to explain "The wall behind us rises about 10-12m vertically, and there is a similar wall (creating the canyon) just behind the photographer, so its a fairly claustrophobic place, and not an easy dive.". Wow! Pictured from left to right are Doug Biggs (Instructor & Guide), Susi Moser and Richard Scholfield. It sounded like a bit of a multinational effort, as Susi is Swiss, and the camera was deftly wielded by Mia, who is Swedish! Sunday 22nd November - 10.5 mile run, The 6 Bridges Challenge. (01:39:46). Friday 27th November - 2.6 mile run, Jesmond to Gosforth. (00:23:54). Friday 27th November - 2.7 mile run, Gosforth to Jesmond. (00:24:26). Saturday 28th November - David Fairlamb's Beach Bootcamp. (00:45:00). This is the latest draft of the route to give you a rough idea of where I'll be running in 2011.